Thomas Wolfe left an indelible mark on American letters. His mother's boardinghouse, now the Thomas Wolfe Memorial, has become one of literature's most famous landmarks. He composed many passages and created many characters based on boyhood remembrances experienced in this house. In his epic autobiographical novel Look Homeward, Angel, Wolfe immortalized the rambling Victorian building as "Dixieland"--but originally called "Old Kentucky Home." A classic of American literature, Look Homeward, Angel has never gone out of print since its publication in 1929, keeping interest in Wolfe alive and attracting visitors to the setting for this great novel. The sprawling frame Queen Anne-influenced house was originally only six or seven rooms with a front and rear porch when prosperous Asheville banker Erwin E. Sluder constructed it in 1883. By 1889 massive additions had more than doubled the size of the original house, but the architecture changed little over the next 27 years. In Look Homeward, Angel Thomas Wolfe accurately remembered the house he moved to in 1906 as a "big cheaply constructed frame house of 18 or 20 drafty, high-ceilinged rooms." Wolfe lived here until 1916, when he entered the University of North Carolina. 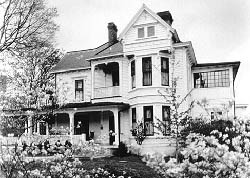 In 1916 Wolfe's mother, Julia Westall Wolfe, enlarged and modernized the house, adding electricity, additional indoor plumbing, and 11 rooms. Julia did not operate the boardinghouse out of any financial necessity. Thomas Wolfe's father, W. O. Wolfe, could well afford to support the family with the earnings of the tombstone shop he owned and operated on Asheville's city square. But Julia, a former teacher, had an obsession for the real estate market and used her profits to buy more property. Descendants remembered Julia, a shrewd and uncompromising businesswoman, as a "driver of hard bargains." Thomas Wolfe was perhaps the most overtly autobiographical of this Nation's major novelists. His boyhood in the boardinghouse at 48 Spruce Street colored his work and influenced the rest of his life. His reminiscences were so frank and realistic that Look Homeward, Angel was banned from Asheville's public library for more than seven years when first printed. Today, Wolfe is celebrated as one of Asheville's most famous citizens, and his boyhood home has become a part of the Nation's literary history. 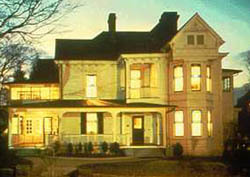 The Thomas Wolfe House, a National Historic Landmark, is located at 48 Spruce St. in downtown Asheville. The Visitor Center is located at 52 North Market St. and is open 9:00am to 5:00pm Tuesday-Saturday. For more information, call 828-253-8304 or visit their website.